Monk shoes or Monk Strap shoes as they are more commonly known were originally designed for men, although they have gained much more popularity among women. Monk shoes can either have a single strap, or two straps, which usually come with a buckle. Whether you are looking for an all-around shoe or even just a work shoe, the monk strap shoe has a classic and sophisticated design that makes it ideal for both casual and smart excursions. Monk strap shoes come in a variety of shapes and designs all with different styles and decorative detail. I have seen ankle boots with monk straps as well as sneaker, flats and oxford style shoes, all featuring the popular monk strap. The monk strap can come in one, two or even very rarely in three straps with a decorative buckle. We as women know how important fashion and style is in our everyday lives, therefore we never stop obessing and prioritizing when it comes to our dress style. Let’s face it our fashion style is not just to impress others, or to follow the latest style, it is our identity and part of who we are. So if you are someone who loves the Monk style shoe, then this article will show you how to wear them, and where to find your perfect mate! For wet and rainy weather conditions always opt for leather, rather than suede monk shoes. Suede leather monk shoes are more extravagant, and only for the daring in fashion. When it comes to fashion, stay true to yourself and choose a shoe that is the right color for your preference. Very important, always keep your shoes clean! When it comes to Monk Strap shoes, there is absolutely no limit to what you can wear with them, as they look great with anything. Keep in mind that you need to consider the style of your Monk shoe. With a more casual and comfy type monk shoe in suede or smooth leather, opt for jeans with a T-shirt and blazer, or even a casual dress or straight leg trousers. For a more formal look, your patent leather and smooth leather Monk Shoes with a sleek and sophist aced design will complement any formal ensemble. Lastly, you will see I have included ankle boots with Monk Straps, these go well with leggings and a flare dress or skirt, and likewise with skinny jeans or jeggings. Every Monk strap Shoe no matter what style or design it is will feature either one, two, or in some cases three straps that cross the bridge of the shoe, with buckle detail. Monk strap shoes can have a high or flat heel, it can even have a Flatforms sole, anything goes. Most Monk Strap shoes are slip on’s which may be an ankle boot or just and normal styled, or oxford style shoe. When it comes to comfort look for features such as cushioning, memory foam, arch support, and a moisture wicking and comfortable lining. Make sure that the shoe is sturdy, durable, well-constructed and of good quality. The sole should offer some grip and traction, and likewise be robust and durable. Color options usually vary from black to brown and cherry or wine red, with materials such as patent, smooth or suede leather, which is either genuine or synthetic. With some thorough research and consideration to different styles, and casual and formal situations, I have listed a few of the most popular options with some exceptional features for you to peruse. All these options are high quality and reliable shoes that will make your search for the perfect Monk shoe, much easier. A comfortable and casual loafer flat with monk strap from Eastland. This slip-on wonder features plush memory foam, and a shock absorbing rubber outsole. Gorgeous leather uppers available in black and brown color options. Features a single monk strap with buckle detail. Plush and soft memory foam footbed for luxurious comfort and support. A durable rubber outsole for good traction with a slight heel. This exquisite and sophisticated patent leather number will work remarkably well as a flat dress shoe, for almost any occasion. You can pair this number with almost any formal or semi-formal outfit for a smart dressy look. Manufactured from durable and genuine leather with a black, or wine color option, both patent style. A durable and supportive flat synthetic sole with a slight heel for added elegance. One monk strap feature with a stunning buckle decorative detail. I absolutely love Dr. Martens, not just for their funky grunge style, but similarly for their exceptional durability, and highly slip resistant outsoles. These are a stunning pair of two strap monk style slip ons, ideal for everyday wear and even as a work shoe. Available in two smooth leather, black or wine red color options. Durable and 100% leather uppers with two monk straps and exquisite buckle detail. The sole is air cushioned for comfort and shock absorption. Excellent slip resistance on wet and slippery terrain. Features the classic Dr. Marten DNA and style. Something gorgeous and comfortable to pair with leggings or skinny jeans, the Blowfish Verde is a stylish ankle boot with two monk straps. Durable and stylish synthetic uppers available in a few neutral colors for your perusal. A double monk strap with two superb buckle closures. Ideal for casual outings or even to wear to the office. Something a bit more daring and different from Wild Diva, a funky and fun style creeper with one monk strap. Manufactured from vegan leatherette materials with material top design. Features a full flatform sole that is comfortable and shock absorbing. Padded on the inside with a secure and highly comfortable fit. Excellent quality, ideal for any occasion. If you suffer from any foot conditions that cause pain or discomfort, the Apex Linda is a Monk styled shoe with extra depth and pain relief features. A durable rubber outsole with a firm heel counter for stability and traction. Soft and supple full grain leather uppers with a moisture-wicking polyester lining. The pressure relief insoles offers cushioned comfort and reduces pressure. A roomy toe box that will accommodate bunions and hammer toe. The outsole is likewise SATRA certified for slip resistance. Available in wider width options and larger sizes for every foot type. 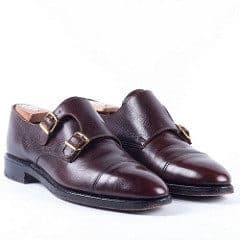 The monk strap shoe is a fabulous shoe style that you will find in almost any shoe type and design to fit your needs and fashion requirements.